Do your sponge cakes always come out as light and fluffy as you’d like? You may have heard that baking is a science, well here is the most basic recipe which proves it is. Baking isn’t just luck, it’s a science, tried and tested through generations. 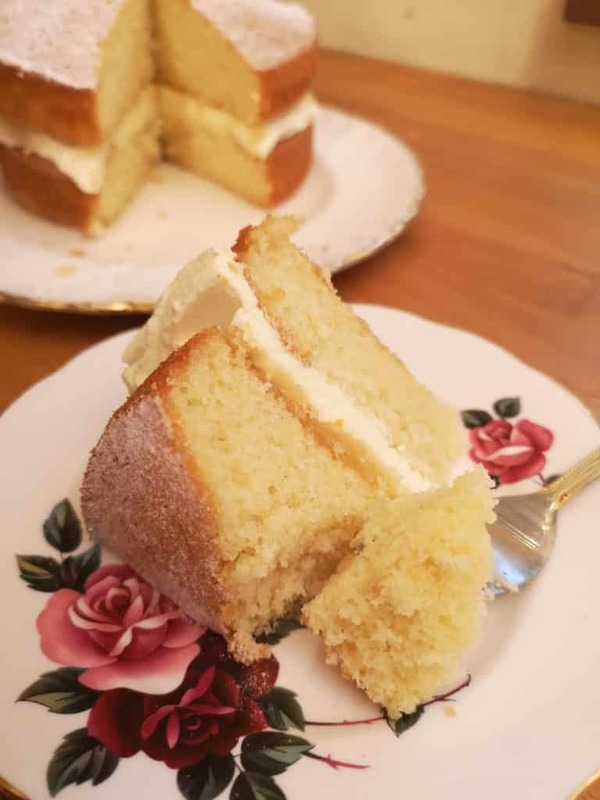 Baking is a combination of the right ingredients and the right techniques…and this combination of ingredients and technique will make the perfect, light fluffy Vanilla Sponge Cake, in England known as a classic Victoria Sponge. Cakes are made up of 4 basic ingredients: Butter, Sugar, Eggs and Flour with a raising agent. Quantities vary to get different results, but to get this perfect Victoria Sponge all ingredients are equal. If you know a little about why each ingredient is there, if things go wrong you can work out why and which ingredient is the culprit. I’ll be putting another post together later this week on what each ingredient does. But, just as a quick, and very basic guide you have Eggs and Flour to give some structure, whilst Sugar gives sweetness and Butter flavour. This recipe is one of the easiest and most scalable ever. It starts with your eggs. Weigh them in the shell. I used just 2, but I only made a small 2 layer 6” inch cake. For a 3 layer 8” round cake I would recommend 4 large eggs. Once you know the weight of your eggs, you weigh all the other ingredients to the same weight. So, my 2 eggs weighed 135gms, which meant I used 135gms of baking spread, 135gms of caster sugar and 135gms of plain flour. When I sifted the flour, I added 1.5tspns of baking powder – 1 tspn, rounded to the nearest half, per 100gms of flour. Note – I never use self-raising, as you don’t have as much control, and you never know how long the raising agent has been sat in it. Once I cracked the eggs, I was going to lose the weight of the shell, so to get that back I added 1tbspn of milk, per egg, before beating them ready for the mix. For flavour I also added a teaspoon of Vanilla Essence, which can added either to the butter or the egg mix. Always weigh your ingredients. Perfect cakes require exact ingredients. Don’t try and wing it by using Cup measurements, leave them for less precise baking like cookies and brownies. If you want to make perfect cakes, from scratch, you need to invest in a set of scales and weigh all your ingredients. Do you use the creaming method? For this recipe you should! Make friends with the creaming method. Make it your go to method for any cake that starts with butter and sugar. There are many ‘all in one’ recipes out there but believe me they will never produce a sponge cake as light and fluffy as one using the creaming method. The creaming method starts by adding air to your mix. Air is exactly what you need for a light and fluffy cake. The Baking Powder, when activated with moisture, will also start to produce carbon monoxide, adding air to the mix. But the more you can get in to start with, the better! Put the sugar and butter (or baking spread) in a stand mixer and using the paddle attachment, beat it until its changed colour to at least 3 shades lighter, and you can no longer see the sugar granules. Beating it like this will allow the sugar to start the dissolving process, which means it won’t have to do that in the oven, which could result in a dense, syrupy texture. It also adds air, which is why it changes in colour. Next you need to add your beaten egg and milk mix – but do it slowly! Adding too much liquid, too quickly will make it curdle. Also adding eggs that are a different temperature to your creamed mix will make it curdle – hence the importance of having everything at room temperature. If they’re different temperatures the fats of the butter and eggs won’t emulsify properly. If it does start to curdle you will start to lose all that lovely air, and, well basically, it goes a ‘bit funny’. A curdled batter can create irregular air distribution through your cake when it’s baked. If you start to see it curdling pop a dessertspoon of flour into the mixer. This will help it come back together. Don’t add too much flour at this stage though as 2 things will happen. Firstly, it’ll start to knock that valuable air back out, and it’ll start to strengthen the gluten in the flour which will result in a tough cake. Also, make sure you mix on as high power as possible, without it covering the kitchen and/or you, as this will aid the 2 fats emulsify better. When all the egg mix is added, stop the mixer. You’re now going to finish the batter by hand. Place a sieve over the bowl and sift together your flour and baking powder. Why do we sift it? It’s not as some people think to get air into it, it’s to make it finer, less likely to clump when in the mix, and to make sure there are no foreign objects in it. I actually sift all my sugar for exactly the same reason. Now, using a large metal spoon, or a rubber spatula, carefully fold the flour in. Folding means cutting through the mix and folding it in on itself. Don’t beat it or stir it, as, again, you’ll lose all the lovely air you have taken the time to lovingly add. Fold it until all the flour is incorporated. Pour the batter into your baking tins, which should be well greased with baking parchment on the bottom. I then scrape a well in the middle. As a cake bakes, the edges will bake first. Then when the inside heats up it will need to expand and that’s why you get a dome on your cake. There are a few tricks for avoiding a dome – baking at a lower temperature, adding a ‘baking belt’ to your tin, or as I do, starting with less mix in the middle to start with. Why do you not want a domes cake? Well, if you’re doing this for a living, the less cake you have to cut off to make your cakes level, the less waste you have, and the less money you throw away. No method is fail safe, and there may always be a chance you have to trim your cakes, but the less you trim the better. I recommend you bake these in several shallow pans. I have tried baking in one big deep pan and slicing the layers. However, as it is such a light cake, the airbubbles inside can’t support themselves, and it collapsed in on itself. When I tried to bake in a deep tin, the inside of my cake ended up tough and chewy. Lastly, give you tins a couple of good bangs onto the work surface. This will ensure the mix is distributed into the corners of the tins and will encourage any large air bubbles to rise to the surface. I bake a 150c (which is quite low – to avoid the domes). Pop your cakes on the same shelf if possible and don’t open the door for at least 25 minutes! Again, you may have heard how you should never open the oven while a cake is baking, or that you should never bang the door. There is a very good reason for this! As the cake is baking the air inside is getting hot and expanding. This is when it’s at its most volatile. If you open the door, and let a cold gust of air in, it may stop the air from expanding, or worst still, pop all those lovely air bubbles and then there is only one, sad, result – a sunken cake! Slamming the door of the oven may also pop the bubbles, again resulting in a sunken cake. Be gentle and be careful. So, no matter how tempted you are….DO NOT OPEN THAT OVEN!!!!! After 25-30 minutes test your cake to see if it’s done. I do this by either pressing the top – if it bounces back its done. Or the old tried and tested method (but slightly riskier as you could again pop air bubbles and cause a sunken cake) stick a skewer in the middle – if it comes out clean, it’s done. What is this cake best for? This classic Victoria Sponge is ideal as an afternoon tea cake. I filled mine with orange buttercream and lemon curd. The Womens Institute frown upon buttercream – I once got disqualified from a local cake baking competition for using it – and recommend filling with JUST raspberry jam. However, in my mind the classic combo is actually vanilla buttercream and strawberry jam, or even fresh whipped cream and strawberries. This cake is also great for celebration cakes. If you are covering your cake in fondant, I would recommend filling and crumb coating before wrapping it in cling film and leaving it overnight to settle. I have also put a couple of cake drums or a thin book on top to mimic the weight of the fondant and allowing it to settle better. If you try to fondant it immediately it will settle afterwards and muck up your fondant work. This cake is also great in a tiered cake, if your dowelling and internal structure is good. This cake, however, is NOT good for sculpting or carved cakes. It’s just too light and fluffy for the job. Believe me I’ve tried, with terrible results. 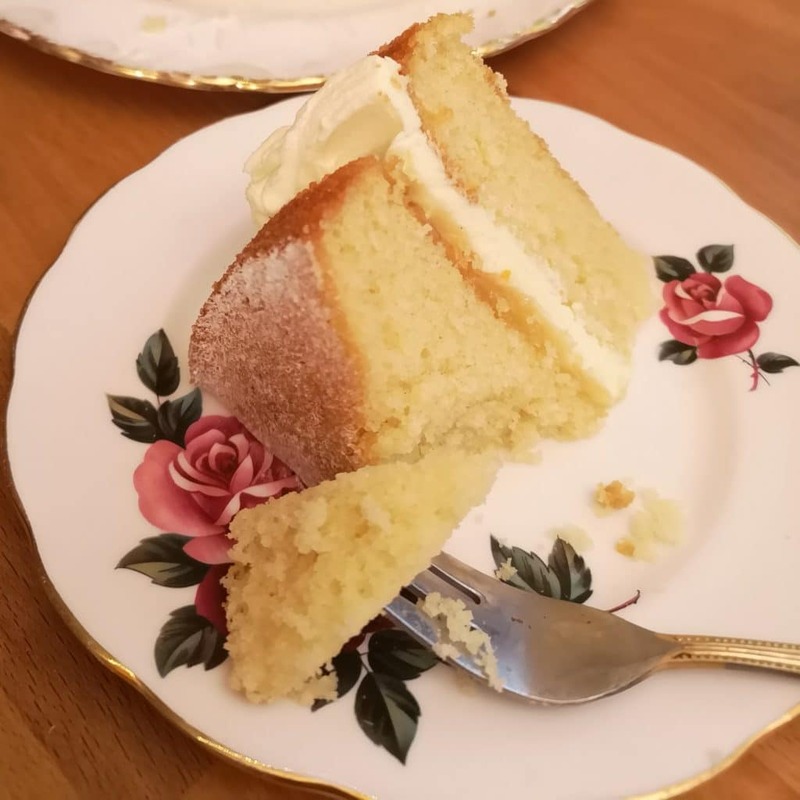 So, I know this post seems long winded for a simple Vanilla Sponge Cake, but hopefully it gives you an insight into why many of the processing in cake making are important to get the best cake possible! Now, the only decision you have to make is – what are you going to fill yours with?